To Nyco on the "Ships starting with N" page. Post war picture of this ship when named Polykarp (see post war details below). Delivered from Nylands mek. Verksted, Oslo in Aug.-1938. Captains: Ch. Engebrethsen from the time she was built until 1946 (see also the note further down on this page). Nov. 19 Suez   BS 9 For Colombo. (Page 1 gives arrival Dec. 7). Febr. 13 New York City St. John's, N.F. Febr. 21 SC 120 St. John's, N.F. for Greenland. May 20 New York City New York City May 21 NK 542 Put back. Febr. 21 New York City Santiago, Cuba Febr. 27 NG 418 For Santiago, Cuba. May 10 New York City Key West May 17 NK 613 Thence Havana, May 17. Oct. 16 Gitmo Barranquilla Oct. 20 GZ 97 For Barranquilla. Nov. 16 New York City   NK 651 Detached Nov. 22. Dec. 30 Gitmo Cartagena, Col Jan. 4-1945 GZ 112 For Cartagena. Febr. 13 Gitmo Cartagena, Col Febr. 18 GZ 121 For Cartagena. March 27 New York City New York City March 28 NG 498 Returned with engine defects. Apr. 9 Gitmo Cartagena, Col Apr. 13 GZ 132 For Cartagena. Excerpts from two articles by Captain Engebrethsen which appeared in "Norges Handels- og Sjøfartstidende" in May-1947, received from Tor Leiv Torvik, Norway (see his message in my Norwegian Guestbook). It will be noticed that some of the dates and other details in this narrative differ slightly from those found on the archive documents. In Sept.-1939 Nyco was on a voyage from Dakar to Bordeaux with ground nuts, and carrying 9 French passengers, having departed Dakar on Aug. 25, arriving Bordeaux on Sept. 6. After discharging she docked at La Pallice, then made a voyage to Brasil, The West Indies and New York, later to Venezuela and Texas, where cargo was picked up for Buenos Aires with arrival the latter on Jan. 11-1940. 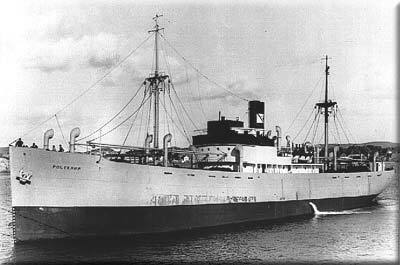 She departed Rio de Janeiro at the end of Febr.-1940 with a cargo of coffee for Tanger, Turkey, Palestine and Egypt, via St. Vincent for bunkers. Arrived Tanger in the morning of March 18-1940 and left that same evening for Istanbul. Seized by a British destroyer and ordered to Gibraltar where she remained for 3 days. When was broke out in Norway on Apr. 9-1940, Nyco was in the Mediterranean on a voyage from Jaffa to Alexandria with the remainder of the cargo of coffee, arriving Alexandria that same day (see also Page 1). She was on time charter to a Persian company in Hong Kong and was to be delivered for time charter in Suez in the morning of Apr. 25 at the latest, but was kept in Alexandria and could not leave until Apr. 17. She was stopped at Port Said, but after a telegram had been sent to Hysing Olsen she was cleared for departure on Apr. 24 (my page Nortraship has info on the difficulties during those early days), with arrival Suez Apr. 25 in time for the deadline. She subsequently sailed to Calcutta via Aden with a cargo of salt, arriving Calcutta on May 17. She now traded in the Far East and the Indian Ocean. In the fall of 1940, she made a voyage from Singapore and Colombo with general cargo and war stores for Suez, via Aden for convoy, having to wait there for 4 days. The convoy of 28 ships was attacked by Italian aircraft, but all the ships made it safely to their destinations. Note that she's listed as bound from Aden to Suez in Convoy BN 7, which originated in Bombay on Oct. 19 and arrived Suez on the 26th and also included Askot, Egerø, Inviken and Nyholm - see the external link provided in the Voyage Record. After having discharged and loaded a new cargo at Suez for 12 days, she returned to Singapore via Colombo, celebrating Christmas that year in Singapore. (She's listed as bound for Colombo with fertiliser in Convoy BS 9, again with Askot and Inviken in company, ref. link in the table above - convoy departed Suez on Nov. 19 and dispersed on the 26th, Nyco arriving Colombo on Dec. 7, according to Page 1 - she later arrived Singapore on Dec. 19). On Jan. 1-1941 she arrived Rangoon with a cargo of petrol in barrels, which were to be transported to China across Burma Roads. After having unloaded this cargo on Jan. 11 she was taken over by Ministry of War Transport (for the rest of the war) and continued trading between Rangoon, Colombo and Calcutta. By the spring of 1942 the situation in these areas had become so critical that it was decided that the Norwegian ships remaining in this service were to be withdrawn; some went to Australia, others to the U.S. Nyco was to be among the latter group, but first she loaded a cargo in Calcutta a week before Easter 1942. She was attacked by aircraft south of Ceylon but arrived her destination Cochin safely (see also Page 2 - it looks like she had been in Calcutta, or Sandheads, for almost 2 months). After having made a voyage to Bombay, and another to Aden with petrol from the Persian Gulf, she arrived Cape Town in Sept.-1942 (Page 3 gives arrival as Sept. 7). From there she headed to Port Elizabeth where a 3" gun and other armament was installed and by the middle of Nov.-1942 she was ready for departure to the U.S. Captain Engebrethsen had to leave at that time due to illness and he says that Captain Thorvald Andreassen* took the ship to the U.S. Captain Engebrethsen says he was subsequently relieved by Captain H. Østerbø. *In an E-mail from Helge Christoffersen, Norway (his source: National Archives of Norway) it has been brought to my attention that this is an error. Nyco's captain from Nov.-1942 until Febr.-1943 was Johannes Andreassen, her previous 2nd mate (from May-1942 until June-1942) and 1st mate (from Sept.-1942 until Nov. 19-1942, when he took over as captain, remaining as such until Febr. 11-1943). He had previously served as boatswain on Ole Jacob when that ship was captured in Nov.-1940 (follow link for details), subsequently joining Mabella as 2nd mate in Dec.-1940, until that ship was sunk in March-1942. He then joined Hermod as 2nd mate at the beginning of Apr.-1942 and was on board when that ship was sunk just a few days after he had joined her. From Apr.-1944 until June that same year he served as st mate on Rena. It's possible Captain Engebrethsen had known Captain Thorvald Andreassen and gave his name by mistake in his report (see also Seirstad). As will be seen when going back to Page 3 of the archive documents, she went from Port Elizabeth back to Table Bay (Cape Town), then on to Pernambuco and Trinidad and from there to Guantanamo, where she arrived Jan. 1-1943 (convoy link in Voyage Record). Together with Glarona, she joined Convoy GN 32 that same day, arriving New York on Jan. 9. The following month, she's listed in the slow, eastbound North Atlantic Convoy SC 120, which left New York on Febr. 13 and arrived Liverpool March 5; Nyco, however, only went as far as St. John's, N.F., where she arrived Febr. 21 (her final destination was Greenland*). This convoy will be added to an individual page in my Convoys section, but for now, see the section listing ships in all SC convoys - the Norwegian Brand, Gausdal, Mathilda, Norhauk, Norsktank and Vest are also included. Nyco made two voyages to Greenland for the U.S. Army that year, carrying troops and equipment for the U.S. bases. The last voyage was very trying, taking over 5 months, Nyco having been caught by the drifting ice. She arrived New York via Reykjavik in Dec.-1943 and Captain Engebrethsen returned to the ship, whereupon she made voyages New York  Cuba  Colombia and Panama, always in convoy. Her 1944 voyages start on Page 3 and continue on Page 4 and Page 5. The latter document also shows most of her 1945 voyages (as can be seen, she was in New York on VE Day), while the rest are listed on Page 6 (to Apr.-1946). Convoy information can be found in the Voyage Record. * As mentioned, Nyco had arrived St. John's for Greenland on Febr. 21-1943. She's subsequently listed, together with the Norwegian Polarbjørn, in Convoy SG 21, departing St. John's on March 8, arriving Greenland on the 16th. She later returned in Convoy GS 22, which left Greenland on Apr. 16 and arrived St. John's Apr. 21. In July that same year we find her, along with the Norwegian Annik, Aun, Carmelfjell, Gudvor, Havmøy, Iris, Lutz and Ørnefjell, in Convoy SG 28, departing St. John's on July 15, arriving Greenland July 19. Nyco returned with Convoy GS 36, which left Greenland on Nov 19 and arrived St. John's on the 24th, again with Havmøy and Iris in company. Links to all these convoys have been provided in the table above. In Jan.-1946 she made a voyage for United Fruit Co. with copper phosphates from Baltimore to Puerto Armuelles, Panama and Golfito, Costa Rica. After having discharged her cargo she went to Cuba via Christobal to pick up a cargo for New York. When in Savannah on March 29-1946, Captain Engebrethsen paid off and was replaced by Captain Johannes Zopfi (compare these voyages with what is shown on Page 6). In Apr./May-1947 Nyco arrived Fredrikstad, Norway for the first time since she left the yard in Oslo in Aug.-1938. Sold in May-1947 to Einar Rasmussen, Kristiansand S and renamed Polykarp (sailed for Fred. Olsen in 1947, later for Svenska Orient Linien). Condemned following a fire on Sept. 30-1949 when in Puerto Cabello, Venezuela. (According to this external page, she was later sold by insurers and in 1950 sailed as Lahneck, then as Imkenturm in 1956 and as Anna Capano in 1961 - sold for breaking up in 1970). Back to Nyco on the "Ships starting with N" page. Sverre Blix got another ship named Nyco in Febr.-1951, also built by Nyland mek. Verksted, then in Jan.-1962 another Nyco was delivered from Moss Værft.